Once planted, perennial plants and shrubs have the ability to grow year after year for a long-lasting addition to the garden. Grown in a wide range of sizes, shapes, colors and textures, there are perennial plants that grow in every season to have the landscape in bloom and with color throughout the year. Many perennial plants are drought-tolerant to withstand limited amounts of moisture. They typically grow best in sun and require well-drained soil to flourish and thrive. Butterfly bush (Buddleia davidii) is a perennial shrub with a rapid growth rate and medium to coarse texture. It has a rounded form and arching branches that make for a large perennial shrub variety. Butterfly bushes grow up to 10 feet tall and reach a maximum width of 8 feet. The gray to green oval-shaped, spring-blooming foliage on butterfly bushes grows 4 to 10 inches long and is followed by the bright summer-blooming flowers. The 4- to 10-inch-wide panicles on the butterfly bush are cluster-like and grow in a wide range of colors including, lilac, purple, white, yellow and pink. Butterfly bushes are drought-tolerant shrubs that have flowers that grow on new growth. They grow best in full sun and moist, well-drained soil but tolerate a wide range of soil varieties. Butterfly bushes are suitable in USDA zones 5 to 9. Purple coneflower (Echinacea purpurea) is a perennial flower that grows in USDA zones 3 to 9. They have a clumping growth habit and reach a height of 6 feet tall and spread of 1 to 3 feet wide. 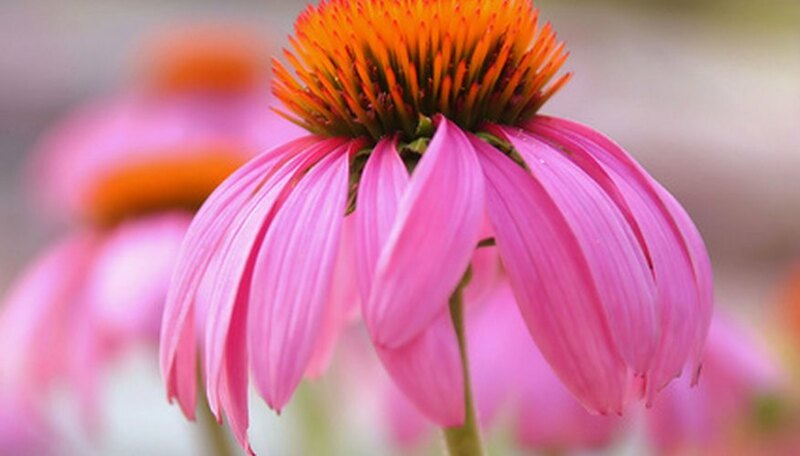 Purple coneflowers have 5-inch daisy-like pink to purple flowers that bloom from midsummer to early fall. Surrounding the purple coneflower rays is the orange to copper central cone that attracts winged creatures like butterflies and bumblebees to the garden. Purple coneflowers are able to tolerate a wide range of conditions including, heat, humidity and drought. They grow best in full sun and well-drained, deep soil. To promote a long flowering season, deadhead the spent flowers as soon as they are noticeable. Showy stonecrop (Sedum spectabile) is a perennial plant that is suitable in USDA zones 4 to 9. They grow in upright clumps that reach 1 to 3 feet tall and wide and bloom from August into fall. Showy stonecrop bear deep pink 3- to 6-inch-wide flower clusters that are made up of tiny star-like flowers. The succulent-like foliage of showy stonecrop is thick and ranges from blue to green. Showy stonecrop grows best in full sun and well-drained soil that is neutral to alkaline in nature. They also tolerate heavy clay soils.